Mary Franklin posted her personal wrap-up for Star Wars Celebration VI on the StarWars.com Blog. Looks like my little red droid made the summary twice! 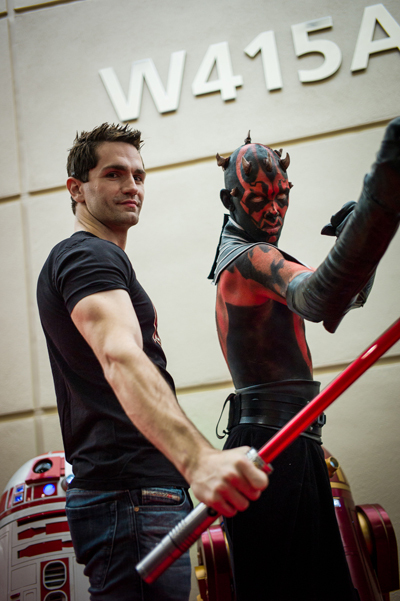 Below if the first appearance, hanging out behind the voice of Darth Maul, Sam Witwer. You'll have to visit the blog entry yourself to see the second photo! The new blog has consistently impressed me. The content and bloggers are an awesome mix of folks from inside and outside of Lucasfilm and is never without a nice personal touch. Head on over to StarWars.com to check it out for yourself.